This guide is designed to help people find the best XP Ring/Necklace for grinding Eternium for them. The basis of this guide is to show what can be achieved outside of "perfect" jewelry for people at different levels of progression in the game. Whether you want "perfect" or "good enough" jewelry, this guide will help you find what is best suited to both your budget and your Champion Level. 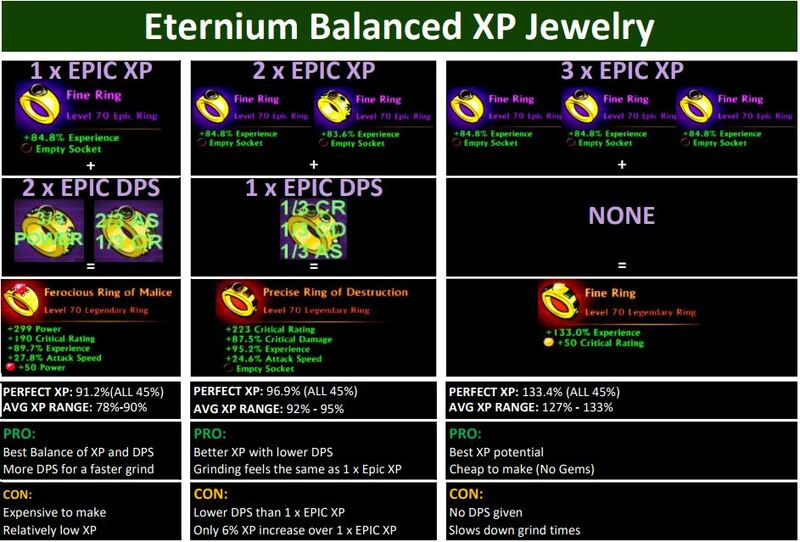 NOTE: The following reflects building balanced XP jewelry, NOT perfect XP jewelry. While I give examples of what "perfect" is, most people do not want to spend hours to days and millions of gold to find perfect sample jewelry. Once you reach level 70 and begin to "grind" Champion Levels (CLs) to become more powerful, it becomes important to have the most Experience gain you can manage in order to complete levels the most efficiently. Experience % gain comes from both gear and jewelry, but jewelry is both the easiest to get because you make it and the easiest to control. Since there is a constant balance between the times it takes you to complete a map (Based on DPS and Movement) and the amount of XP it gives you, making XP jewelry can keep that balance in check. To maximize on this balance, we can break down the needed XP to DPS ratio for all three (3) pieces: 2 rings + necklace one needs into a few categories. - CL1-CL150 you should only focus on making DPS Jewelry and simply use XP from gear you find. These levels are easy to complete with minimal XP% gains. - CL151-CL400 you should have made DPS Jewelry already and are looking to get some more XP to complete levels faster, but don't want to give too much DPS up. - CL401-CL700 you are focused on filling in those CL points to get all DPS points after CL700, but cannot sacrifice all 3 pieces of jewelry for XP. The method and math for creating XP Jewelry between Rings and Necklaces are the same, meaning the outcomes use the same formula and thus the same. That said, please refer to the “Most Efficient Perfect Jewellery Crafting (SAVE LOADS of STONES, GOLD and TIME!!!!!! )” sticky thread in Players Helping Players if you have not done so already. If you need some help finding what will work best for you, check out ezcry4t3d's modified calculator by vreely as it can really help figure out what you’ll end up getting. 1) Jewelry using 1 EPIC XP ring/necklace and 2 EPIC rings/necklace of other stats. 2) Jewelry using 2 EPIC XP rings/necklaces and 1 EPIC ring/necklace of other stats. 3) Jewelry consisting of all XP stats. NOTE: Choices used for DPS were my own and should not reflect what you need for your character. I spent roughly 20m gold plus gems and several months trying out different combinations and the 1st and 3rd example below are near-perfect. However, I utilized mostly "good enough" rings (43.7%-44.5% XP Range Average) in the middle example above, but feel it is also the best option for most needs.These three are the best you are going to find and I really hope it saves you some of what it cost me! Every one of the three types of XP Jewelry above have their own benefits and deficits, so chose wisely and also note you may end up making a combination of the above three to fit your own needs. Personally, I am at the CL401-CL650 level and find using the 2 x EPIC XP rings/necklace to be the best fit for me. Sure, I lose a little DPS, but I also gain a little XP and in reality, these rings (2 x EPIC XP + 1 x EPIC DPS) are relatively easy to make and afford. As such, I find the middle one to be the overall best value as it doesn't need to be perfect to always get you at least 90% XP per ring/necklace. Shout out to Mcool and abc127 who made me break down and write this. Last edited by c0mad0r; 09-06-2017, 05:18 PM. This is a shoo in for a sticky. Great work, c0mad0r! I'm glad to have this for reference for myself and for those we send here. I'll add a link here from the newb guide. Sticky worthy! Ty 4 posting the pictures. That really helps me plan for future! I think you'll want to change CL 650 to 700. That's when all points go into offense. Utility maxes out at 700, defense at 600. Totally forgot about those last utility points, changed and thank you! Thanks a lot for this very useful post. In the image for the first ring (the one with two DPS epics), on one of the epics you can read 2/3 CR and 1/3 CD. According to the final result, I imagine the epic ring actually had Critical Rating and Attack Speed (instead of Critical Damage), right? In any case, why is final CR higher in the second ring (the one with only 1 DPS epic)? Is it because you used more yellow stones in the second ring? In the image for the first ring (the one with two DPS epics), on one of the epics you can read 2/3 CR and 1/3 CD. According to the final result, I imagine the epic ring actually had Critical Rating and Attack Speed (instead of Critical Damage), right? Fixed, typo, should have been 2/3 Attack Speed. In any case, why is final CR higher in the second ring (the one with only 1 DPS epic)? Is it because you used more yellow stones in the second ring? Personally I find this guide misleading and not that useful. 1 xp + 2 dps is an obvious choice for most newbies. 2 xp + 1 dps is a waste because of very low xp gain, it's simple math and all the existing guides show it pretty explicitly, no need to spend "20m gold plus gems and several month" to see that. 3 xp + 0 dps is a choice for high CL players only, and they can probably make the decision by their own based on their experience. No need for long text and another jewelry sticky imo. On top of that the guide is a bit incomplete as well. It only considers crafting 4 stat mixed DPS/XP jewellery, while 2 or 3 stats on the legendary would be an option too. Haven't done the math, but I'd expect about +5% XP for each stat less on the legendary. Well written,I m newbie but in my opinion one should consider pure XP only when he's to the point that he's killing fast enough because it variate players to players. narf 4 stat legendary is best in any form compared to 2 stat or 3 in my opinion, if not I would like to see some comparison examples since I haven't done much studying about it. @void I have been wondering from a long time,what's Ur cl. 3 stat will max at ~100.2% and 2 stat at ~106.6% and the other 1-2 stats get a slight boost as well in comparision to 4 stat jewellery. I'd wager using this would require some fine tweaking with the complete XP-gear. For example an XP/Power ring gives just enough Power to oneshot everything while still providing ~10% more XP than the conventional 4 stat ring. It'd be the step between 2XP-4 stat legendary and full XP rings. If full XP cuts down a tad too much, it may be viable. That being said I doubt I'll ever craft or even use such a thing. This is what I was saying,but using combination of XP/DPS &pure XP as (3-0,2-1,1-3,0-3) according to need is perfectly viable. I simply chose to focus on ring combos as suggested by ALL the other ring guides since 2015 and thus the "popular choice". Not to discount it though, here is the breakdown for each. NOTE: I did actually make a few of these types and have screenshots if you want to see the final 2 or 3 stat rings I made, but feel that with the exception of a 3 stat ring using attack speed, the rest are not very useful. Last edited by c0mad0r; 08-22-2017, 02:42 AM.